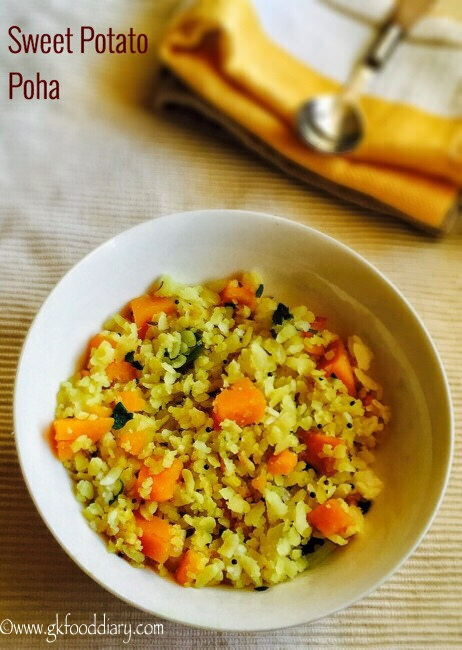 Sweet potato Poha - Healthy breakfast or evening snack made with sweet potato, poha/flatten rice/beaten rice. Wash sweet potatoes and cut them into small cubes. Set aside. Keep all the other ingredients ready. Chop onions, green chillies and coriander leaves. Take juice from lemon and keep it ready. Wash and soak poha in water until its soft enough to mash. Squeeze the water completely from poha once it's soft.Heat oil in a pan and add the items to temper one by one. Saute until cumin seeds cracks. Then add onions along with green chillies and saute onions until it's transparent.Then add cubed sweet potatoes and toss it well. Add 2 tbsp of water and cook it covered for 5-7 minutes or until the sweet potatoes are soft. Make sure the sweet potatoes are soft enough to bite but not too mushy. Then add soaked poha with sugar and required salt. Mix well. Cook everything covered for two to three minutes and switch off the flame, add lemon juice & garnish with coriander leaves.